Most Wednesday mornings, I can be found wandering through the extensive, well-sourced produce of the Santa Monica farmer's market, alongside notable chefs doing their own shopping. A recent Wednesday I had two interesting sightings - Jon Favreau, and Indian chef, Senthil Krishnamurthy. Favreau was a fluke, but Chef Senthil was not. 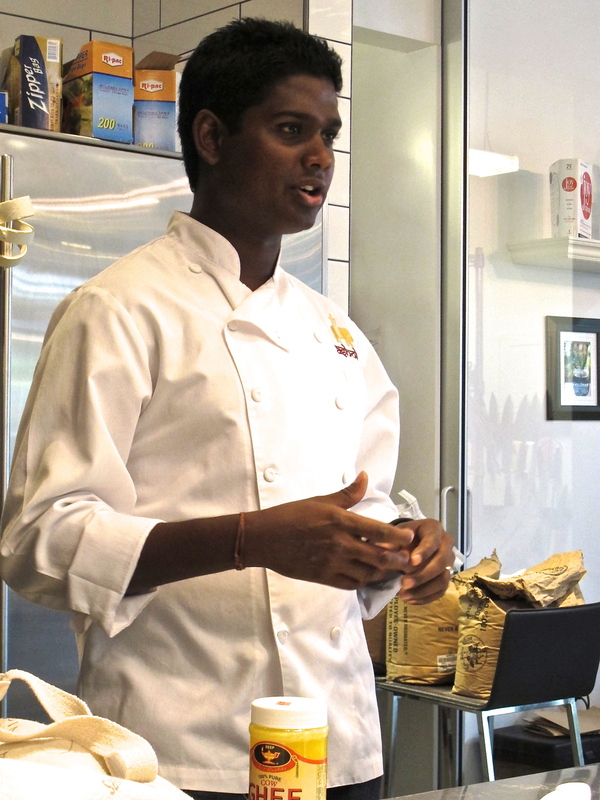 Senthil played host to Gourmandise School's "Follow That Chef" series. About once a month, the cooking school brings in a new chef that takes participants through the farmer's market to share food tips and pick up products for a demonstration in the kitchen after. Last month the focus was pickling, and this month, we were treated to authentic Indian cooking from Southern India, where Chef Senthil grew up. Krishnamurthy was raised with a reverential perspective on food. Food was used to heal the body. If you had a cold, you were given hot peppers to eat and sweat out the virus. Cumin was liberally used in dishes to help with proper digestion. Women in his town would grate turmeric and put it on their face to stop facial hair from growing. While evidently this worked, they had to walk around with yellow-tinged faces from the spice for up to 3 days. I'm not sure which I'd prefer. Chef Senthil picked up chicken quarters at one stand for a curry he wanted to make, but then asked if there was any dark meat. The longer the dark meat cooks, the better and richer the flavors are. We were in luck that dark meat was available. Krishnamurthy continued dolling out cooking tips as we wandered the market like, don't use Roma tomatoes in a curry because you want the tomato to be tart. Senthil's mom would often scowl at him when she saw him cooking a large batch of curry with multiple tomatoes, since less is more in her opinion. Meanwhile I didn't think the two tomatoes he grabbed was going to be enough for the day's curry to feed 12 people! As we wandered through the Market, Chef Krishnamurthy included more helpful notes like to look for a crisp stem when purchasing produce as well as dry leaves on herbs to ensure maximum freshness. Water on the leaves saps the flavor and texture. 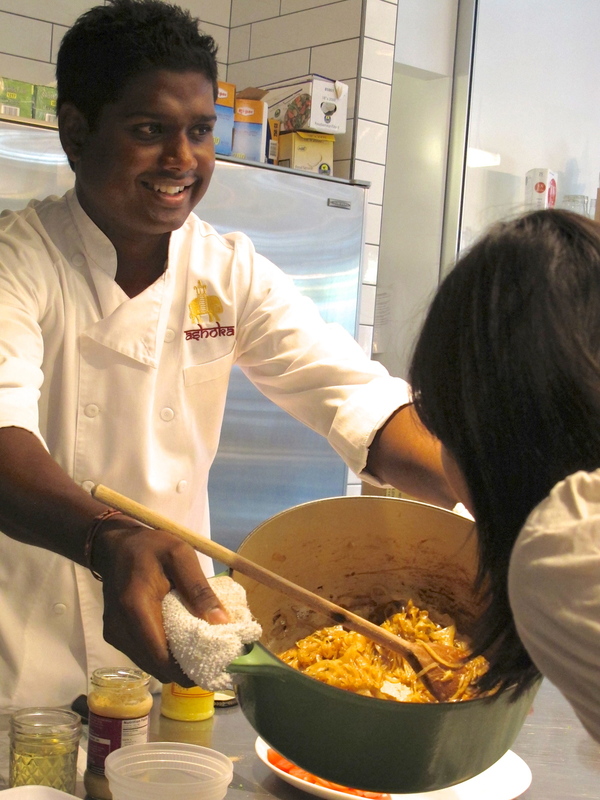 Back in the kitchen at Gourmandise in Santa Monica Place, we watched Chef Senthil whip up a full four-course meal starting with cumin flavored rice, or Jeera Pulao. It was an easy dish, sautéing cumin in ghee, and then dropping it in a rice cooker with Basmathi rice, water and salt. The curry, Chettinadu Chicken Sukka, contained ginger garlic paste, which isn't an ingredient I usually cook with, but the acid works well to help break down and nearly puree the onions and tomatoes added to the dish. We also helped make Phulka, which is a bit like naan, but there's no yeast added. It's made with just whole wheat flour (Atta flour), salt and some water. It's rolled out into small rounds and quickly cooked in a dry pan for about 30 seconds on each side. After, it's placed directly over an open flame where it balloons up, assuming you rolled it thin enough. Senthil also made a traditional Raita, which I expected to be full of cucumbers and lots of yogurt and spice. In his hometown in S. India, they only use red onions, a small amount of yogurt and some salt. The salad is just supposed to neutralize the palate. Cucumbers weren't typically in the South Indian home so they never used it in their raita. I'm not much of a straight up onion fan, but the heavy onion to small yogurt mix really did help remove some of the heat from the curry. The recipes were all easy to follow and not too complicated. The food tasted fresh, but balanced. The most amazing part of all was that the class and meal were free. Gourmandise uses some of their "Follow That Chef" sessions to try out new teachers to see how they interact and instruct a class. I'm happy to be a guinea pig for that trial if this is the quality received each time. I'd say Chef Senthil more than passed. He's new to LA, having cooked at well-regarded restaurants in Utah for 2 years, as well as on a cruise line for another 2 years where he got to sample and incorporate the varied flavors of his stops into his cooking. He's now teaching Indian cooking and culture in individual's homes and for private events. To learn more, visit his website, Ashoka Cuisines. Here's one of the recipes we enjoyed from Chef Senthil. Heat Oil in a thick bottom pan. When Oil is hot add fennel seeds and curry leaves, stir for 10 seconds make sure not to burn. Add onions and sauté until they become translucent. Add ginger garlic paste and cook well to lose the raw flavor of the paste. Add rest of the spices with salt and sauté well for 2 minutes. Add Chicken stir well and add tomatoes and water. Stir occasionally until it attains the desired consistency. Add yogurt, chopped Cilantro and Mint at the end. Stir well and turn the heat off.